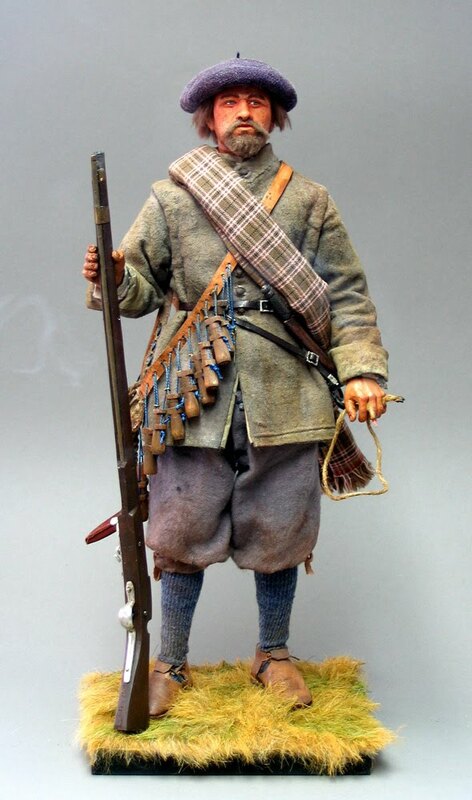 Typical of the Lowland Scottish soldiers from all sides that fought in the British Civil Wars between 1642 and 1651, he wears the rather drab outfit of undyed woolen "Hodden Grey" cloth typical in Scotland at the time, and the characteristic Scots bonnet, apparently universal in Scotland between about 1480 and 1780: it actually evolved into the various kinds of Kilmarnock and Glengarry bonnets we associate with later Scottish soldiers. The Scots Army was the first to be raised , in 1639 and 1641 to oppose Charles I's religious policies , and then became the ally of the English Parliament once Civil War started in 1642. Once the New Model Army had emerged as the chief power in England by 1647 , it ultimately became their enemy as well. It was , despite its size, not a very successful army, which some have attributed to its being plagued by Presbyterian ministers attached to it at all levels ; but its very presence tipped the scales against the King. He is armed with an imported Dutch matchlock musket, and a cheap sword sometimes referred to as a " Sinclair hilt " . He wears this on a waistbelt with iron fittings . 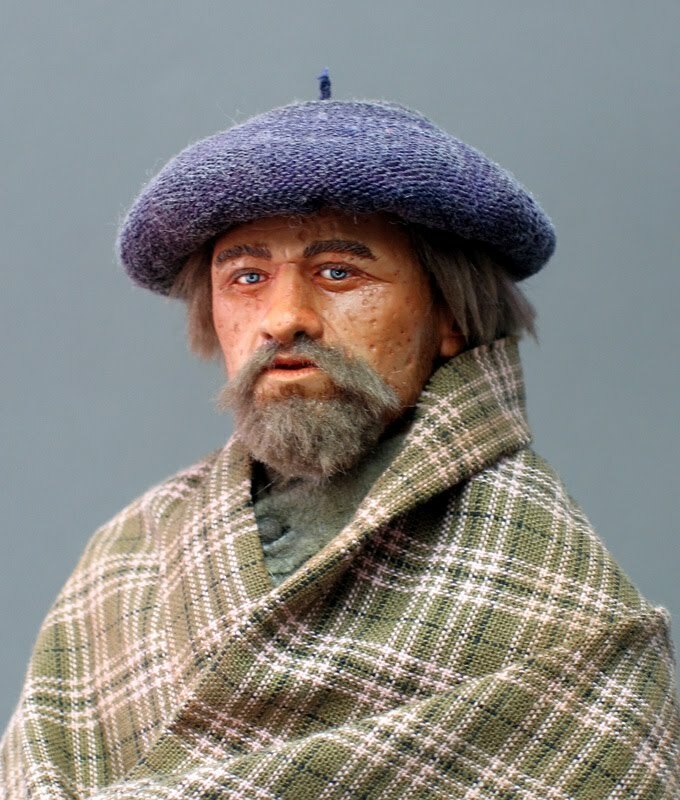 On his back is a coarse waxed linen snapsack to carry his food, and over his shoulder he wears a plaid, which is his overcoat and blanket combined. His face bears the scars of smallpox , an endemic disease at the time. He carries a lit match in his left hand : I luckily found some tarred twine which burns just like the real thing ! Here he draws his sword: I use mild steel for the blades , and pewter for the hilts of all my swords. The scabbard is from very thin wood veneer, covered in leather. Notice also his eating knife : most people still carried them at this time. The buttons are made from balls of spare cloth : they were known as " dumplings " . 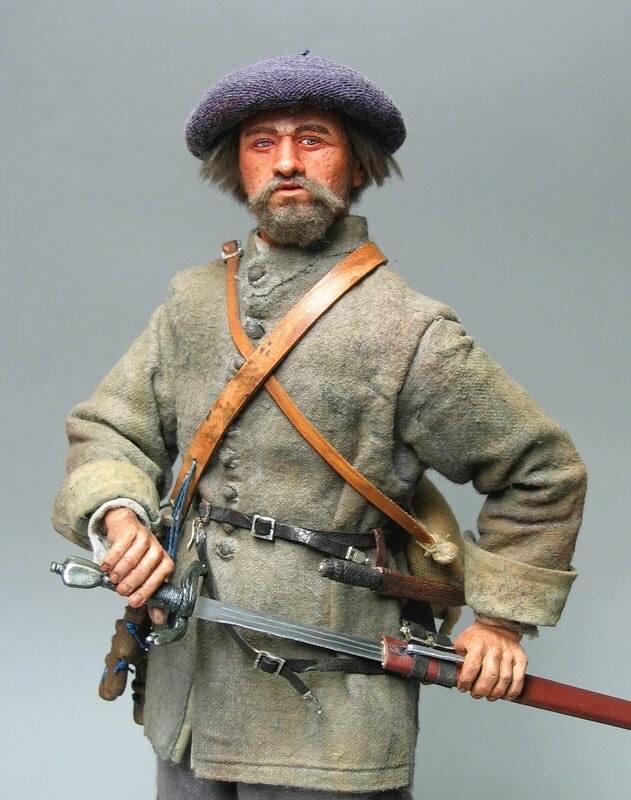 This figure is entirely scratchbuilt : the clothing is brushed cotton, and all the equipment made from leather or white metal. The Dutch musket is available as a resin casting , as are the bandolier bottles : see the Catalogue Section.